Nowadays, dishwashers are a must in just about every household kitchen in California. Once you taste its convenience, you don’t want to let go and you are absolutely right. This is the exact reason why you should trust our dishwasher repair in West Hollywood. Whether you do have dishwasher problems or simply want preventive services, count on our expert team at Expert Appliance Repair West Hollywood, CA. Do you know how your dishwasher works? Everything is monitored by the appliance. The dishwasher adds water and heats it up, opens the soap dispenser, distributes the detergent and water over the dishes, removes food residues and rinses the soap. When one of the sensors, valves or switches is ruined, the procedure won’t be the same. That’s when we come in. We provide dishwasher troubleshooting, find what’s wrong and repair the appliance in timely fashion. If you live in w Hollywood, we can help you quickly. We provide services as fast as we can and every single one of our dishwasher technicians arrives at your home with the proper tools for the job. Experienced in all modern kitchen appliances and most brands, we can service all home dishwashers and also replace their damaged components. Is one of the hoses broken? We replace it. Is the water inlet valve damaged? We remove it and install a new one. You can trust our Appliance Repair West Hollywood dishwasher experts for all replacements and installations. 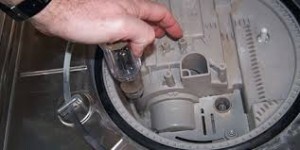 We also offer home dishwasher installation. Since the water and power supply are both important, we do make sure all connections are done right. We make sure the hoses are not kinked and the dishwasher is leveled. Our customers can avoid the hassle of problematic dishwashers by relying on our preventive services. We have dishwasher maintenance expertise and check the appliance thoroughly. Our intention is to service it, but also inform you of its condition so that you will know its strengths and whether it’s important to replace some parts or not. If you want honest, fast and quality services, which will range from minor repairs to installations, do count on us.